Have you ever walked along the street and found that you are purposefully ignoring something because you think your mind is playing tricks with you? You know the kind of thing, the cloud in the shape of a crocodile that changes into something new while you are looking away, or a person with two heads, which was, in fact, two people viewed from an odd angle. A few years ago I started to notice a cherry tree near to my house that seemed to have two different colours of blossom; mostly pink, but a significant part, white. As I was walking to the railway station I just assumed that this was because there were two trees growing next to each other – there were clearly two trunks – and one tree had its branches entangled in another’s. A symbiotic duet of pastels. Then one day I stopped to look properly and found that one tree actually did have blossom of two different colours. Somehow the roots or the pollen of the white blossomed tree had combined with the roots or pollen of the pink and made some kind of genetic graft, leaving something that was evidently true but still not quite believable. 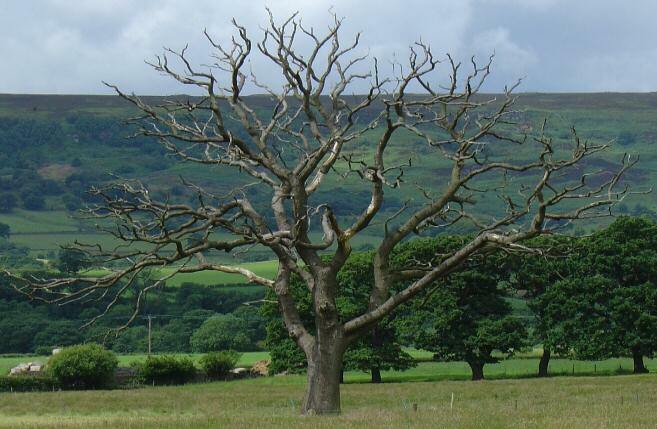 Last year a disreputable builder broke one of the branches and clumsily cut deep into the hybrid tree to try and make amends, and for a while I was worried that the tree would not survive. Thankfully it did, and the strange blossom returned, to my delight. Last night I was working on a response to an e-mail from a well known science writer, and needed to check the source of a graph he had provided, which looked incomplete. 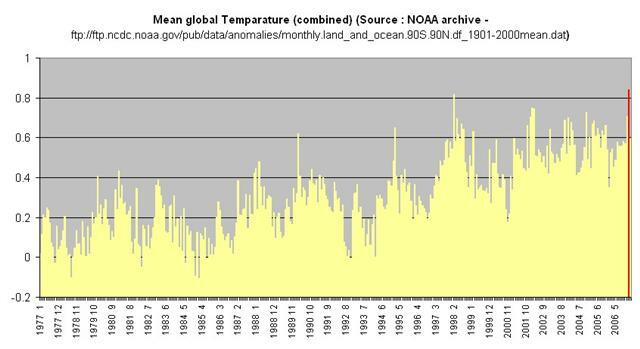 The graph was of average temperature anomalies since 1880; in other words, each data point shows how much higher or lower the temperature was than the average temperature for the entire period. This data is produced by NOAA, the United States National Oceanic & Atmospheric Administration, and combines sea and land-based observations to form the most accurate record of global temperature available. I extracted the raw data from ftp://ftp.ncdc.noaa.gov/pub/data/anomalies/monthly.land_and_ocean.90S.90N.df_1901-2000mean.dat and created a chart in Excel to show the variation in temperature over the last 100 years. 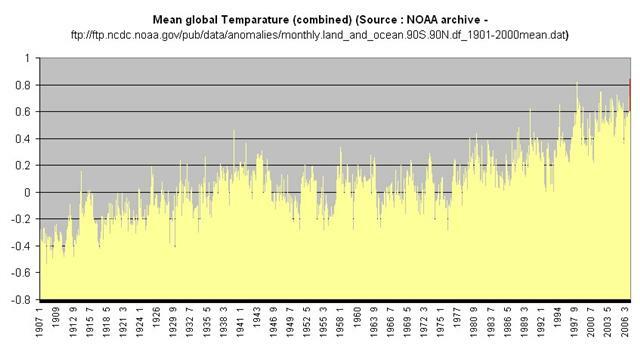 To the untrained eye – and the trained eye – it shows that temperature is increasing from 1907 to 2007, with some dips and some peaks, especially in the middle of the 20th century, but generally an increase. I don’t know if you can see, but there is a tiny red bar in the far right-hand part of the graph. I made that bar red because I was worried about it. It was for January 2007. Just one tiny bar in a mountain range of over a thousand bars. Nothing was missing. The data hasn’t changed and the red bar is still looking significant. It looked like the highest bar. It looked like the highest temperature in the data set. Notice something else, too. Excel has changed the x-axis, to balance the graph at the top and bottom. The minimum anomaly on the x-axis was –0.8 degrees (Celsius). Now it is –0.2. The data has still not changed, but I have added a green horizontal line from the top of the January 2007 bar, along to the (orange) bar for February 1998. 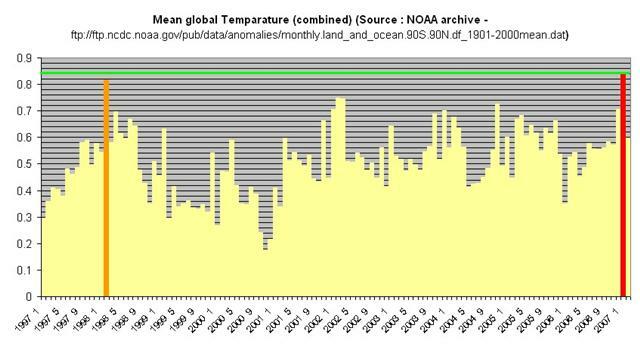 February 1998 is used by many climate sceptics as evidence that the global temperature is no longer rising. It was the hottest month in living memory. As of January 2007, January 2007 was the hottest month in living memory. – Every month for the last 10 years was hotter than the average for the entire period between 1880 and 2007. Not 51%, 90% or 99% of them. Every single month. – 4 of the last 5 years were hotter, on average, than any other year in the last decade except 1998. The hottest year since 1880 was 2005. Whatever you believe about the causes of global warming, the evidence that it is still getting hotter is remarkably persuasive. When I saw the bar for January 2007 I didn’t believe it, but when I stopped to look closer I knew it was real. At the end of 2006 I told my wife that I thought 2007 would be the Year of Climate Change – in a good way. I thought that the tide of evidence and the growing agreement that something had to be done to combat global warming would start to turn humanity on its axis. I thought we would, as a global community, turn those ideas into positive action. I thought we would have more time. I have seen the bar for January 2007 and found something too horrible to ignore. But unlike the strange and beautiful cherry blossom, I want it to go away and to never come back. I hate it! I want to undo the graph and pretend the data never existed. « Did You Have A Good Life?